Abbreviation for pulmonary embolism; preeclampsia. 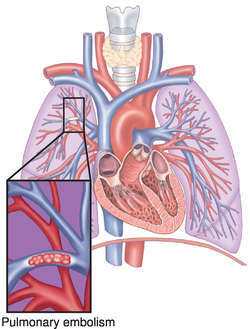 Obstruction of a blood vessel caused by an air bubble. Air may enter a vessel postoperatively, during intravenous injections, after failure to purge intravenous lines, or as a result of rupture of a central line balloon. NOTE: A very small amount of air in a vessel or intravenous tubing is not hazardous. Symptoms include sudden onset of dyspnea, unequal breath sounds, hypotension, weak pulse, elevated central venous pressure, cyanosis, sharp chest pains, hemoptysis, a churning murmur over the precordium, and decreasing level of consciousness. When an air or gas embolism is suspected in the systemic venous circulation, echocardiography should be used to confirm its presence. The suspected site of gas entry should be secured and flooded with normal saline to prevent entry of more gas into the circulation. One hundred percent oxygen should be administered to the patient by nonrebreather mask. The patient should be immediately repositioned with the right atrium above the gas entry site, so that air will be trapped there and not move into the pulmonary circulation or the right heart. A central venous catheter should be placed into the central venous circulation and any gas bubbles and air aspirated from the catheter. Intravenous fluids and inotropic medications may be needed to support blood pressure and pulse. Prevention: All air should be purged from the tubing of all IV administration sets before hookup and when solution bags or bottles are changed; air elimination filters should be used close to the patient; infusion devices with air detection capability should be used, as well as locking tubing, locking connection devices, or taped connections. For central lines, to increase peripheral resistance and prevent air from entering the superior vena cava, the patient should be instructed to perform a Valsalva maneuver as the stylet is removed from the catheter, during attachment of the IV tubing, and when adapters or caps are changed on ports. Chest pain, dyspnea, cyanosis, tachycardia, hemorrhage, hypotension, or shock are potential symptoms. Amniotic fluid embolism is frequently fatal. Embolism due to injected drugs, debris, or talc, often resulting in pulmonary infarction. Embolism caused by globules of fat obstructing small blood vessels in the brain, lungs, and skin. It frequently occurs after fracture of long and pelvic bones or after orthopedic surgery and has been linked to episodes of acute pancreatitis, sickle-cell crisis, diabetes mellitus, osteomyelitis, and liposuction. Effects may be mild and undetected but can be severe, leading to acute respiratory distress syndrome, multiple organ dysfunction syndrome, or disseminated intravascular coagulation. Those most at risk for FE are males age 20 to 40 injured in serious motor vehicle accidents and elderly adults after hip fracture. Findings often include agitation, restlessness, delirium, convulsions, coma, tachycardia, tachypnea, dyspnea, wheezing, blood-tinged sputum, and fever, esp. during the first 12 to 72 hr after injury or insult, when fat emboli are most likely to occur. Petechiae may appear on the buccal membranes, conjunctival sacs, and the chest and axillae in a vestlike distribution. Retinal hemorrhages may be seen on fundoscopic examination. If fat globules lodge in the kidneys, renal failure may occur. Laboratory values are nonspecific but may show hypoxemia, suddenly decreased hemoglobin and hematocrit levels, leukocytosis, thrombocytopenia, increased serum lipase, and fat globules in urine and/or sputum. There is evidence that FE can be prevented when long bone fractures are immobilized immediately. Limited movement and gentle handling of any fractures before fixation may help prevent fat globule release. Patients at risk, i.e., those with fractures of long bones, severe soft tissue bruising, or fatty liver injury, are assessed for symptoms of fat embolism. Chest radiograph reports are reviewed for evidence of mottled lung fields and right ventricular dilation, and the patient's electrocardiogram is checked for large S waves in lead I, large Q waves in lead III, and right axis deviation. The patient's respiratory and neurological status are monitored frequently for signs of hypoxemia. The treatment for the syndrome is nonspecific: good general supportive care of fluid balance, vital signs, oxygenation, electrolytes, and hemodynamics. The patient is placed in the high Fowler's, orthopneic, or other comfortable position to improve ventilation; high-concentration oxygen is administered, and endotracheal intubation and mechanical ventilation are initiated if the patient cannot maintain a PaO2 of 60 mm Hg on 40% oxygen by face mask. Positive and end-expiratory pressure may be used to keep functional alveoli inflated to improve functional reserve capacity. IV fluid administration helps prevent shock. Deep breathing exercises and incentive spirometry to open and stabilize atelectatic lung areas may improve lung capacity and ventilation. Prescribed pharmacological agents are administered; these may include steroids, heparin, and anxiolytic agents such as diazepam.